“When someone says the word “immigrant,” many people likely picture Europeans moving through Ellis Island during the late 1800s and early 1900s. Others think of a more recent time — especially after 1980 — when most immigrants arrived from countries in Latin America, such as Mexico, and, to a lesser extent, Asia. However, it may be surprising to learn that recent data show that the African foreign-born population is one of the fastest growing immigrant groups in the United States. Like the rest of the nation, the size of the African-born population living in North Carolina has increased rapidly since 1970 (when only 600 individuals in the state were African-born). In 1970, African-born individuals were only 1.4% of the state’s 42,000 foreign-born residents. Between 1970 and 1990, North Carolina’s African-born population increased tenfold, to nearly 7,000, and grew by even larger numerical amounts in the following decades. Between 1990 and 2000, the state’s African-born population more than doubled, surpassing 20,000. And it more than doubled again between 2000 and 2008-2012, rising to 44,400. 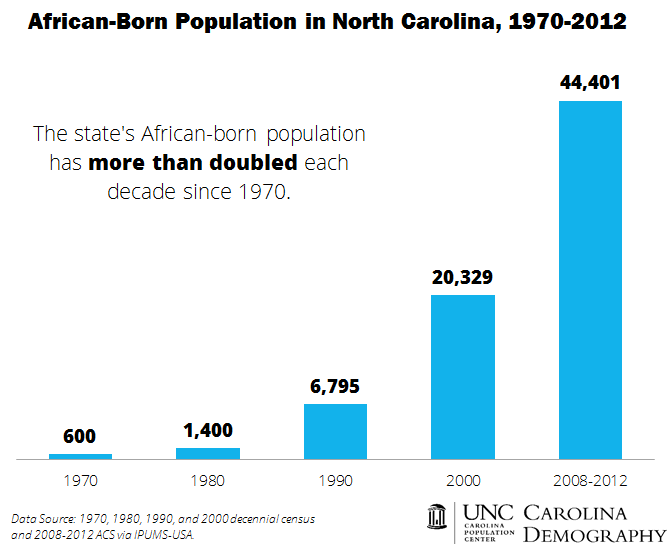 Today, 5.6% of North Carolina’s foreign-born residents were born in Africa. The top five countries of birth are Nigeria (4,570 individuals), South Africa (3,310), Egypt (3,150), Kenya (3,050), and Sudan (3,030). This entry was posted in Carolina Demographics, Migration and tagged Africa, foreign born, immigration. Bookmark the permalink.